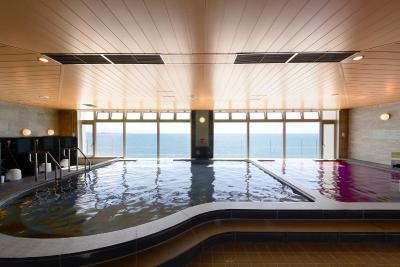 Lock in a great price for Vessel Hotel Campana Okinawa – rated 8.9 by recent guests! The locations is great, perfect inside the American Town which a lot of things to see and do. Just feel the bed is quite hard. I don't know if it's normal here.. But the room is clean and nice. The staffs are very friendly. Breakfast was great! Healthy options! Con: 0700 start is too late for early risers. Otherwise, great breakfast! Location was awesome! 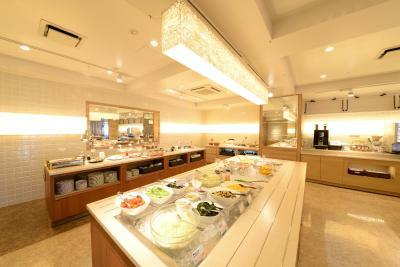 Next to American Village with many different cuisines to choose from. Front desk personnel were great! Very helpful. Proficient in English! Able to make taxi arrangements. It's near American village with lots of eateries and shopping. 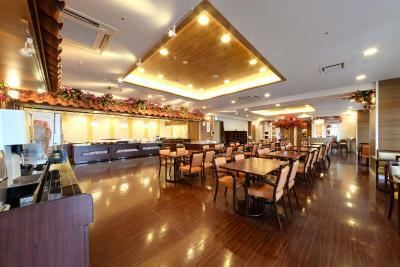 The hotel location is very convenient and can walk to many shops and restaurants. 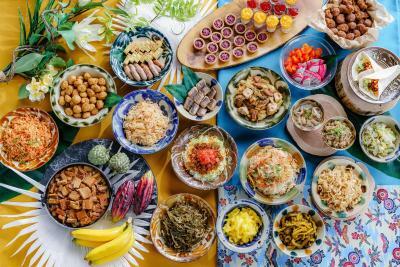 Buffet breakfast had wide variety of asian and american food. 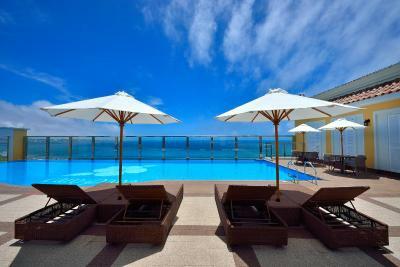 If you plan to stay in American village aera, Vessel hotel must be the top choice! The location, the service, the view from room are unbeatable. The property is in a perfect location! 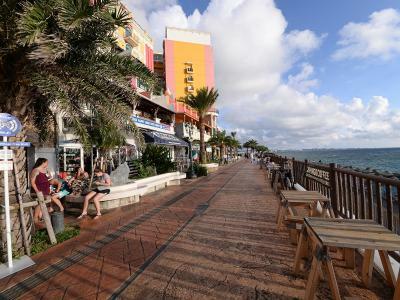 Walking distance to American Village, with shops and food. The room was beautiful! 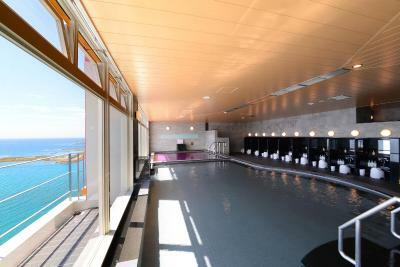 Very nice view from public bath!! 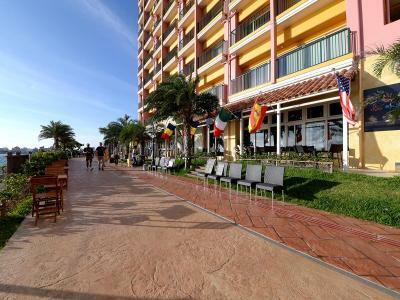 Good location, just next to the Sunset beach and American village!! 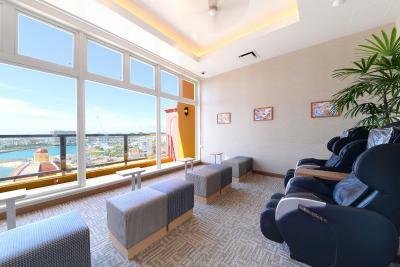 Vessel Hotel Campana Okinawa This rating is a reflection of how the property compares to the industry standard when it comes to price, facilities and services available. It's based on a self-evaluation by the property. Use this rating to help choose your stay! 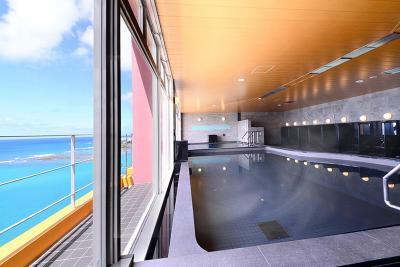 Located right in front of Sunset Beach, Vessel Hotel Campana Okinawa features spacious guest rooms with a balcony and large public baths that overlook clear-blue ocean. 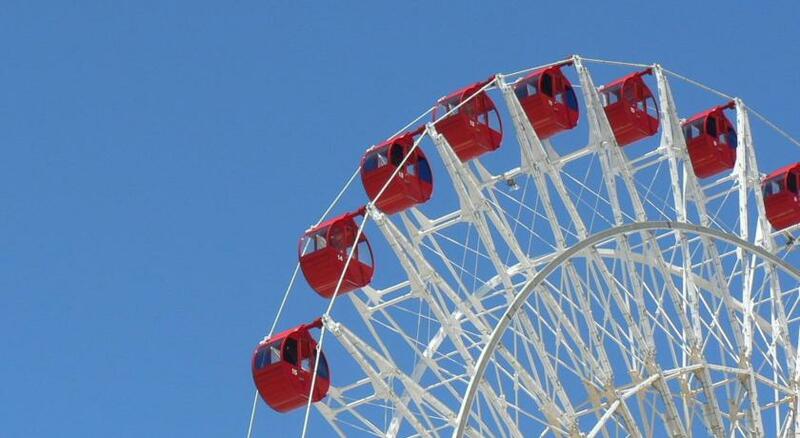 It is located next to the lively American Village complex. Free WiFi is available throughout the property. 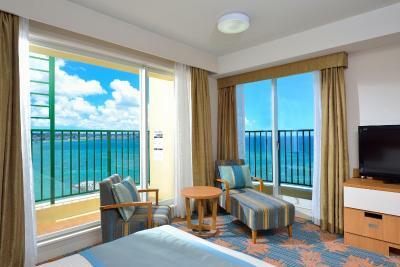 Each bright room is fitted with large windows and a balcony. 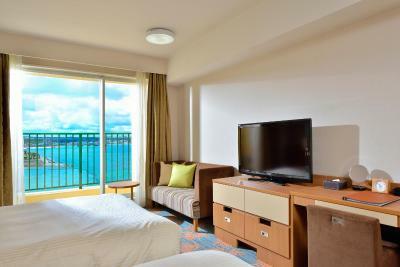 A flat-screen TV with channels such as CNN and KBC, a fridge and an electric kettle are provided. The private bathroom comes with a bath tub, a hairdryer and free toiletries. 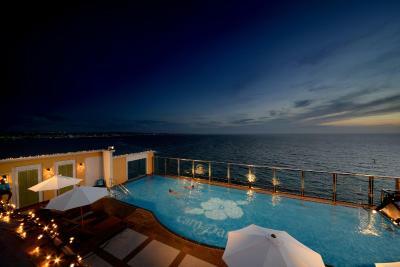 The 24-hour front desk at Campana Vessel Hotel offers free luggage storage services. Friendly staff can also arrange in-room massages and dry cleaning services. Bicycles can be rented to guests who want to explore the area on their own. 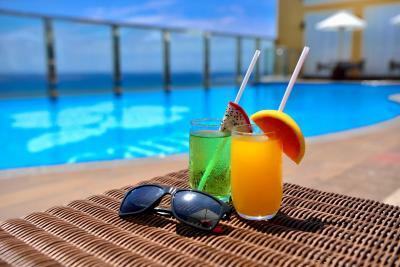 Complimentary drinks are offered between 14:00 and 20:00 at the lobby. 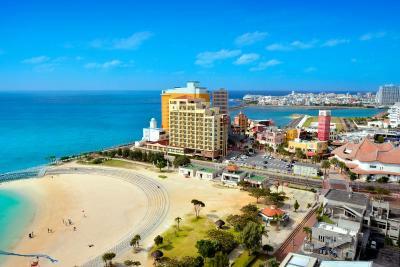 The hotel is a 40-minute drive from Naha Airport, and direct airport limousine buses are available to/from the hotel at an extra fee. 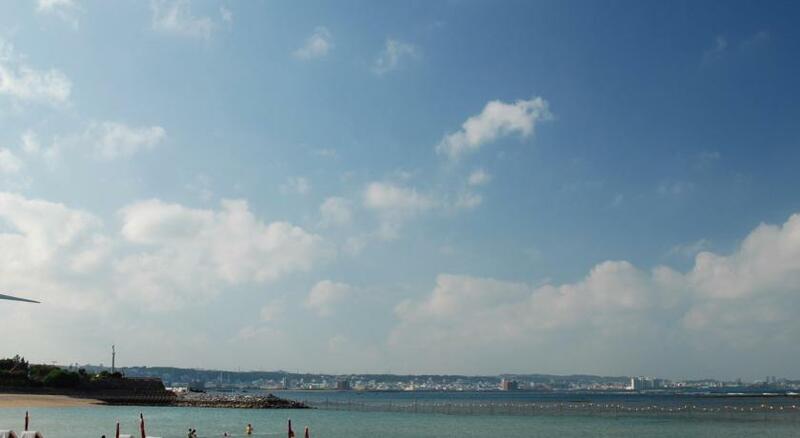 Bokunen Art Museum is a minute's walk from the property, and Carnival Park Mihama is a 5-minute walk away. 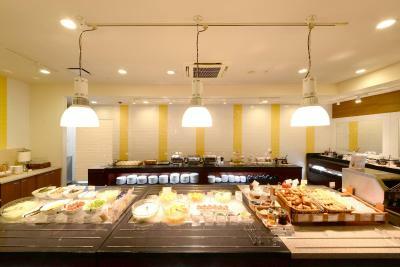 The Vessel Hotel serves a hearty breakfast buffet at the dining lounge every morning. 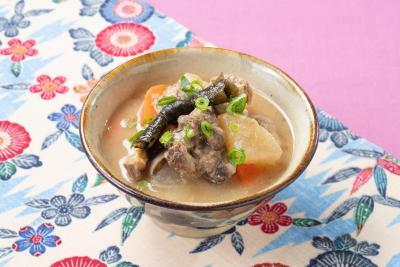 It includes local Okinawa specialties and freshly baked bread. 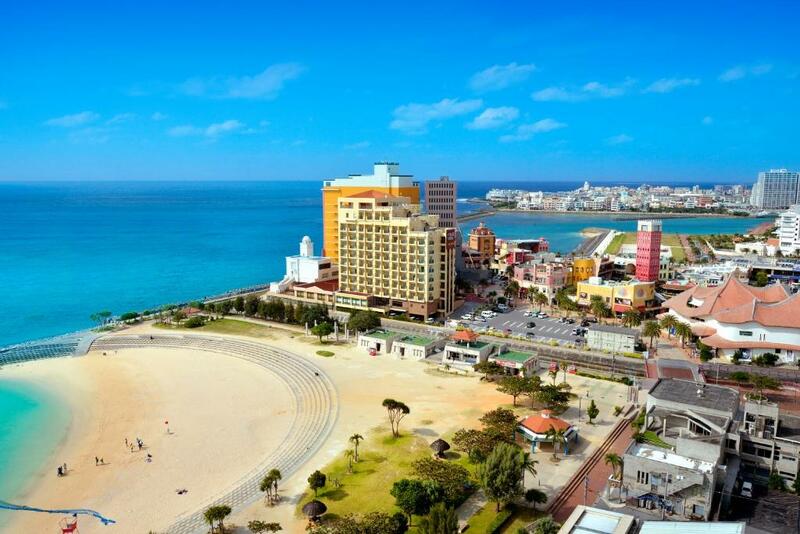 This property also has one of the top-rated locations in Chatan! Guests are happier about it compared to other properties in the area. 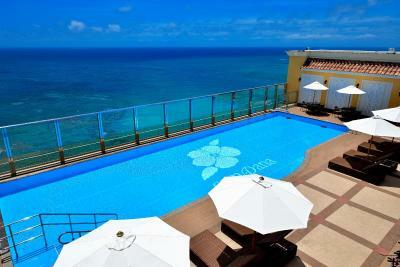 When would you like to stay at Vessel Hotel Campana Okinawa? 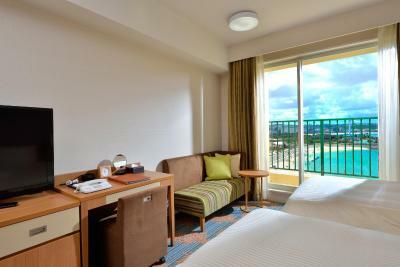 Located on floors 2-10, this room features city views and 2 small double beds 47 in wide. There is an private bathroom and a separate sink for guests' convenience. 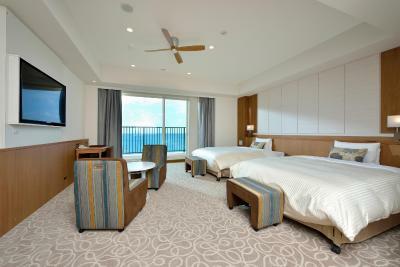 Located on floors 2-10, this room features views of either the East China Sea or Sunset Beach. There are 2 double beds 59 in wide. There is an private bathroom and a separate sink for guests' convenience. 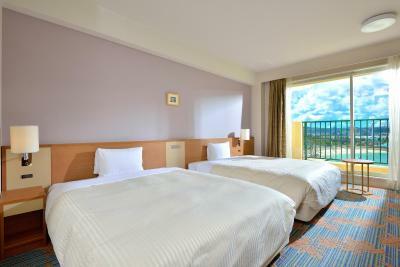 Located on floors 2-9, this room features views of Sunset Beach and 2 small double beds 47 in wide. There is an private bathroom and a separate sink for guests' convenience. 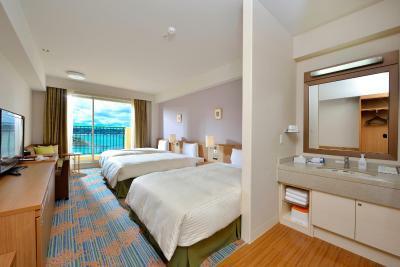 Located on floors 4-9, this corner room faces the East China Sea and Sunset Beach. 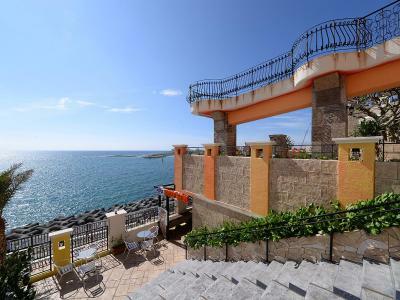 There are 2 balconies and 2 double beds (59 in wide). There is an private bathroom and a separate sink for guests' convenience. 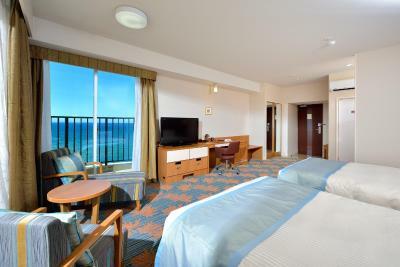 This room features views of Sunset Beach, 2 small double beds 47 in wide and 1 bed 43 in wide. There is an private bathroom and a separate sink for guests' convenience. 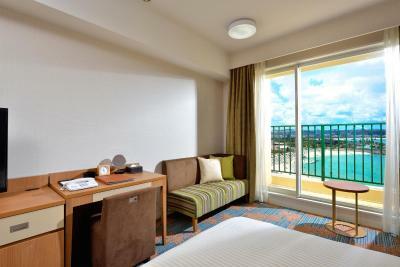 Located on floors 2-9, this room features views of Sunset Beach. 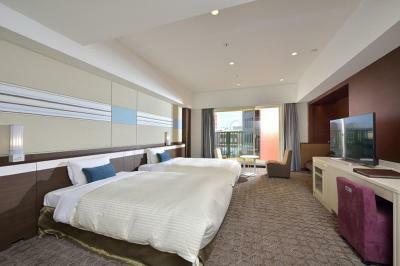 The room comes with 2 small double beds that are 47 in wide each and 2 beds 43 in wide. There is an private bathroom and a separate sink for guests' convenience. 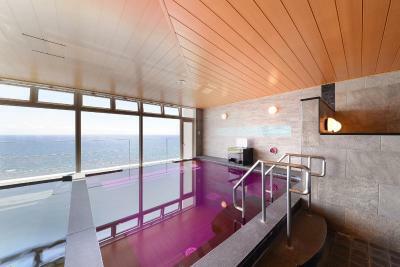 Located on floors 9-10, this suite features views of the East China Sea. The toilet and sink are separated from the private bathroom for guests' convenience. 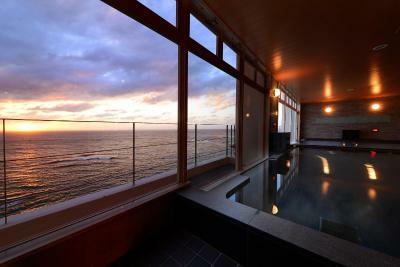 Guests can soak in the bathtub while enjoying sea views. 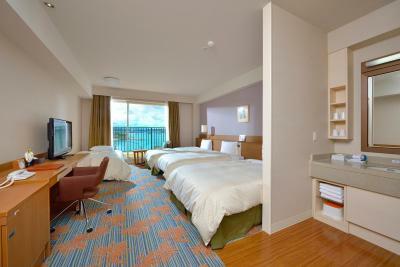 The suite features 2 double beds, 59 in wide each. An extra bed 43 in wide and 35 in wide can be prepared according to the number of guests. Please indicate the correct number of guests at the time of booking. 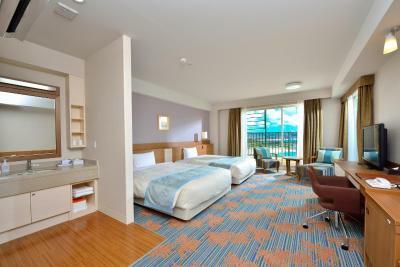 This room features views of Sunset Beach. The room comes with 2 beds, 47 in wide each. An extra bed 35 in wide and 39 in wide can be prepared according to the number of guests. Please indicate the correct number of guests at the time of booking. 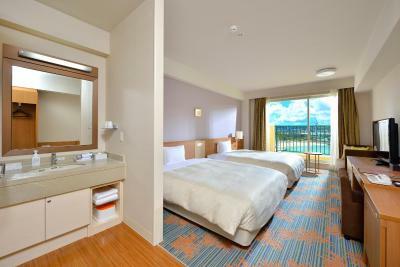 This room features views of the East China Sea and 2 small double beds, 47 in wide each. There is an private bathroom and a separate sink for guests' convenience. An extra bed 43 in wide can be prepared according to the number of guests. Please indicate the correct number of guests at the time of booking. 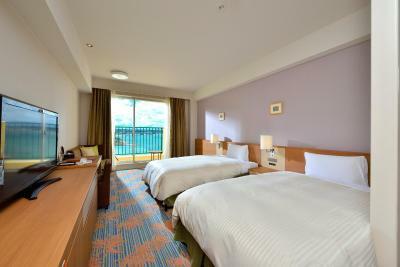 This room features views of the East China Sea and 2 small double beds, 47 in wide each. 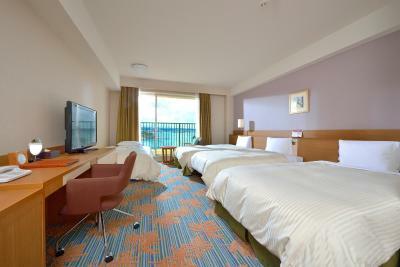 Located on floors 3-10, this room features city views and 2 small double beds, 47 in wide each. Located on floors 3-10, this room features city views and a sink with 2 sinks. The toilet is separated from the spacious private bathroom.The room features 2 beds 47 in wide and 2 other beds that are 43 in wide each. An extra bed 35 in wide can be prepared according to the number of guests. Please indicate the correct number of guests at the time of booking. The room features 2 beds, 47 in wide each. An extra bed 43 in and 35 in wide can be prepared according to the number of guests. Please indicate the correct number of guests at the time of booking. 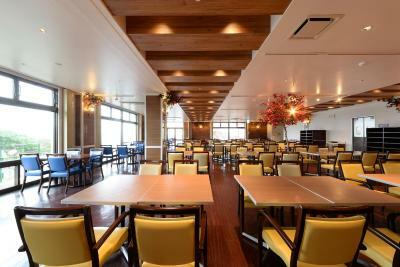 House Rules Vessel Hotel Campana Okinawa takes special requests – add in the next step! 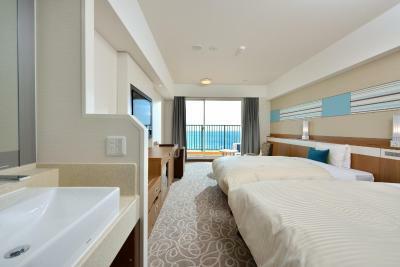 Vessel Hotel Campana Okinawa accepts these cards and reserves the right to temporarily hold an amount prior to arrival. Early check-in and late check-out after are available at a surcharge. Please contact the property directly for more information. If you are arriving later than the expected arrival time you indicated, please inform the property in advance. If the property is not informed by 00:00, your reservation will be treated as a no show. Guests who wish to use a child cot/crib need to make a reservation at time of booking. Guests using a car navigation system are advised to use map code 33525353, because the property's name might not be available in the system. Please contact the property about the airport limousine timetable. 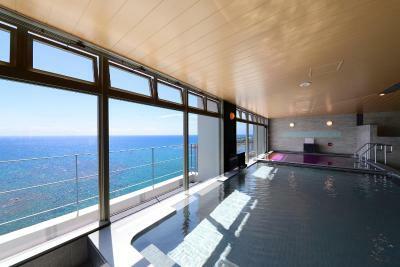 Please be informed that the property's public baths have one-way mirrors and blinds installed to ensure privacy, as an annex building is located near to the property. 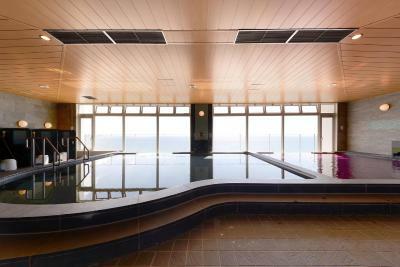 During 18:30 - 01:00, the public bath's blinds will be closed. Please be informed that views from the bath may be compromised during these hours. The main and annex buildings both feature baths with a view. Children 18 years old and below can use an existing bed free of charge. Guests are kindly requested to indicate the number and ages of children that will be using an existing bed in the Special Request box at the time of booking. Additional fees apply for meals for children sleeping in existing beds who are 13 years and above when booking with meal-inclusive rate. For guests staying in the Twin Room: please note that when 1 adult and 1 child stay in the Twin Room, 2 adult rates will be charged. 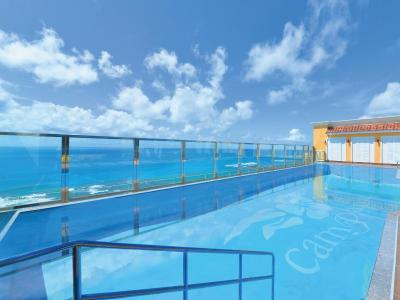 - Charges are applied to guests 6 years and older using the pool. Please contact the property directly for more details. 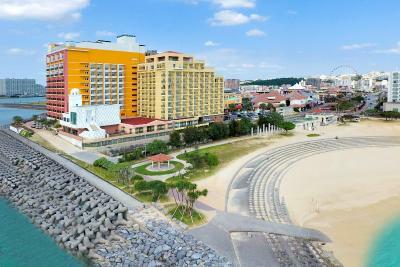 Please inform Vessel Hotel Campana Okinawa of your expected arrival time in advance. You can use the Special Requests box when booking, or contact the property directly using the contact details in your confirmation. Nice sea view in the room with good breakfast. Breakfast hall was crowded, but food supply was constant. Got a free upgrade. View from room is fantastic. 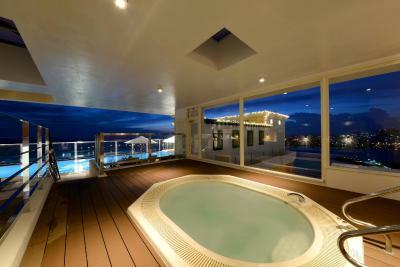 Room is extremely comfortable, bathtub with a view out to the sea is amazing. Every detail is well thought out, from indoor and outdoor slippers, bathrobe, and even robe to wear to the public bath is provided. American village is at ur doorstep. 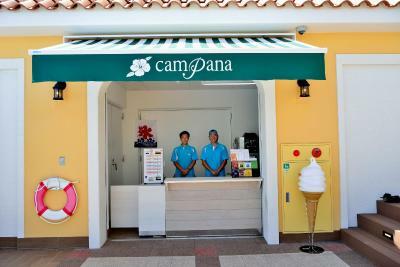 Some shops and restaurants even have special discount for campana guest. Breakfast is fabulous. 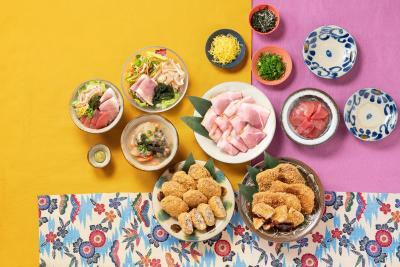 Good selection from local to western food. Staff can’t speak English well.. small requests can easily end up as a big deal! I think the hotel is a little bit overpriced! Maybe because we went there through holiday season! Close to shops and the American Village. Nice breakfast with lots of choices! We enjoyed the local food! Lots of amenities, even hair-ribbons in different colors. We also got a new pyjama every night! We had 22pax family members and some of us were splitted to stay in a separate building. While it was not a big deal as the building is just beside. Our family preferred to be next door to each other. 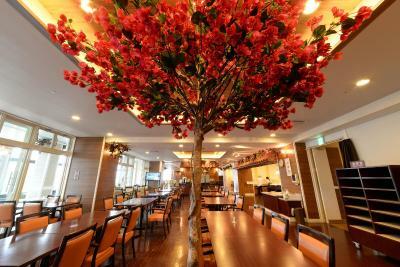 The onsen was good, breakfast selection is delicious, bed is really comfortable and toilet is big and clean... had great view and good location. There were lots of restaurants and shops around the hotel. There is a Lawson just downstairs the hotel... convenient and value for money. Corridor is stuffy, and the smell can be improved. Roof pool is closed during our stay which is very unfortunate, but it requires entrance fee - 800 yen which is way too expensive. We paid for a room with breakfast but didn't realize the breakfast started at 7:00. We had to check out at 6:00. We asked if we could change our reservation to not include breakfast or use our coupons another day. We paid a lot of money for the room with breakfast and was disappointed we couldn't at least get some money back or use the tickets later. 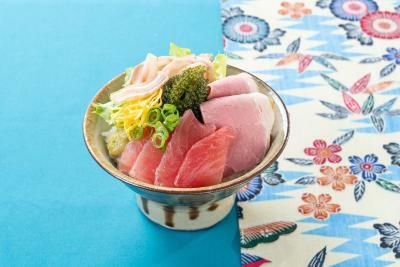 Awesome Japanese breakfast with sea view. Comfortable bed and great location. The family room is very good size, perfect for my group of 5 adults.